Door and Window Safety Tips for Your Home - Lanes Insurance Inc. Although for the most part windows provide a lovely way to enjoy outdoor views from the comfortable indoors, they can be a potential hazard for kids. Children are curious and notoriously prone to accidents, and windows are inviting playthings. Teach window safety early and reiterate the rules often to prevent a mishap and keep your home safe. Don’t place any furniture that is easily climbable near windows. This counts for those who own cats, too, which like to play with screens, blinds and curtains just as much as kids do. Children begin climbing before they can walk, so cribs should never be placed underneath a window. Most window-related injuries happen to kids under the age of five. Make it clear that screens should never be leaned on. They are simply meant to keep pests out, not people and pets in. Install stops so that windows can’t be opened more than four inches. Guards or cages outside of upstairs windows can provide extra peace of mind. Kids under the age of eight should be taught to ask for an adult to open and shut windows for them. Some suggest planting shrubs beneath windows to help cushion a fall. Windows not only let sunlight in, they can keep burglars out. As concerned Alberta home insurance providers, we at Lane’s know that burglars keep getting more and more savvy. According to windowscanada.com, more than 80% of intruders enter homes through windows. 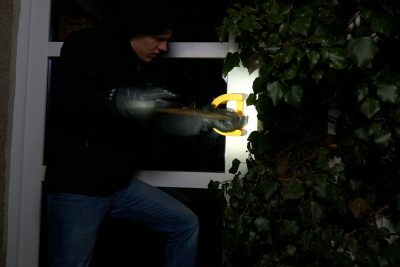 Usually they will take the easy option and try to climb in through an open window, but it is not uncommon for them to use lock-picking tools, crowbars or screwdrivers to pry panes loose or force a window to open. They may also just go ahead and break the window if they are confident they won’t be heard. Having locks installed on all your windows. Always shutting and locking all your windows when you are not home. Adding bars to windows on the first floor. Shrubs are also helpful for deterring burglars from trying to enter through windows. We highly suggest security systems for all homes, and they may even earn you a discount on your home insurance. There are lots of great choices available. We prefer the wireless options, as there is less chance of them being disabled. The best security systems will hook up to all of your doors and windows, and can be connected to both an app on your phone and a security call centre. You can set your system to notify you if a window or door is opened at all times, or just at times when you are not home. While all the small children in the house should be taught to not open windows without permission, they should also know how to open them in times of emergency. Windows should play a part in your family’s fire safety plan, as they provide an additional way to get out when there is no other option. Make sure everyone knows what to do in case of emergency, and go over the plan often. It is essential to keep your insurance company up to date on anything happening with your property. If you update your windows or security system, let your provider know so they can ensure the change is reflected properly in your policy. In addition, perform annual home evaluations of your house and belongings at insurance renewal time to ensure you go over everything annually as well. At Lane’s Insurance, we’re here to help you keep your Calgary home insurance rates as low as possible while still enjoying the vital protections you need for your peace of mind. We offer outstanding rates on home insurance, along with value-added service and money-saving insurance bundles. We are a customer oriented, matter-of-fact insurance brokerage that believes customer service is still important to people. Contact us at our Calgary, Edmonton, Banff and Alberta offices.